For the EP by Circa Survive, see Appendage (EP). Look up appendage in Wiktionary, the free dictionary. In invertebrate biology, an appendage (or outgrowth) is an external body part, or natural prolongation, that protrudes from an organism's body (in vertebrate biology, an example would be a vertebrate's limbs). It is a general term that covers any of the homologous body parts that may extend from a body segment. These include antennae, mouthparts (including mandibles, maxillae and maxillipeds), gills, walking legs (pereiopods), swimming legs (pleopods), sexual organs (gonopods), and parts of the tail (uropods). Typically, each body segment carries one pair of appendages. 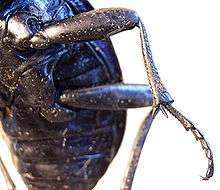 Appendages may become uniramous, as in insects and centipedes, where each appendage comprises a single series of segments, or it may be biramous, as in many crustaceans, where each appendage branches into two sections. Triramous (branching into three) appendages are also possible.